Christmas is such an amazing time; sometimes frustrating, sometimes tiring but alway wonderful. I finally finished my shopping today with one last trip to Walmart for Paul’s gift and the crowds were very thin, not like Monday at the mall – you would never have known there is a recession by the looks of Oakridge Mall on Monday morning between 10-1! Wow! I am having a great time visiting, hanging with my kids and baking in someone else’s KITCHEN! Too bad they don’t have a kitchen fairy! I guess I will have to do the cleaning also. Because of the holidays I won’t get to make my usual rounds of visiting but I am getting in as many as I can in 3 days and we will leave on Thursday for Hanford, CA for the family celebration of Christmas with enough food for at least twice as many people we will have for dinner- especially the dessert, who would know that 12 people need 6 pies, fudge, cakes and cookies! Merry Christmas to all and to all a Good New Years! I thought when we moved away from work, family & friends we would have so much time to do all the things we thought we were missing out on. Since my last post we have missed out on Bingo, Karaoke, bike rides, hikes, dancing, music in the courtyard, Christmas Shopping… The list goes on and on. We have managed to do a few things. I am hooked on the game of pickle-ball. The game sounds pretty tame until you step onto the court and the competitive juices start flowing and before you know it you are slamming yourself into the fence to make that save, diving into the net to return the dip your opponent just served and you realize you are sweating more than if you had just ran 3 miles on the silly treadmill. 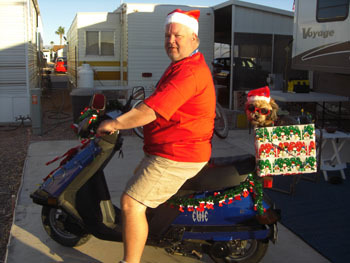 We made a trip to Yuma to visit my parents who are in Arizona until Christmas. It was a very rainy and cold few days so we didn’t make that trip into Mexico for more Tequilla. We also forgot to bring the passports so we were out of luck. I guess we will have to get this weeks alcohol from Costco! I have played golf 3 times in the past 2 weeks and on Sunday we played in a couples group and I won for womens closest to the pin with my second shot on a par 4. That is very good for me. My score was not good but it was right in there with the group so I am happy. Now if I can work on my putting so I can par once in awhile! This week we are making Christmas dinner for friends tonight. Tomorrow is a free day besides, pickle-ball, Karaoke, & music in the courtyard, Wednesday is pickle-ball, helping in the office, and cocktails with the neighbors, a trip to the Heart Attack Grill so Mike can experience the heart attack, and then the rest of the week will be getting ready to come to California for Christmas. I can’t wait. 4 days and counting until we see Stephanie & Amy. Posted in Arizona | Comments Off on Running out of time…. Just let me play ball! Isn’t he cute? 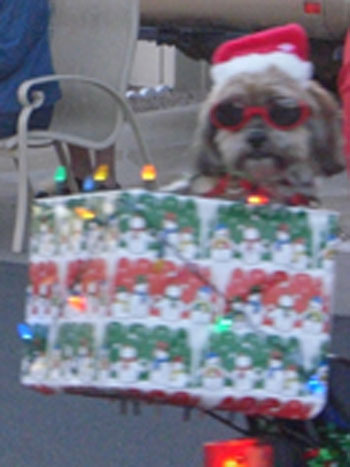 Today was the kickoff to all the Christmas celebrations and just like everywhere it began with a parade. 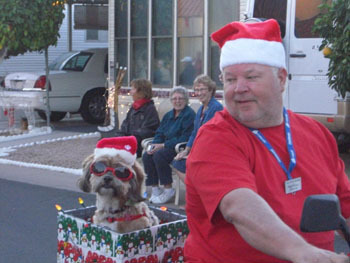 Duke hired Paul to drive him in the parade and then of course off to the dog park. We invited our friends to join us and we watched all the participants in the parade and then it was a big night of Bread Bowl Chili and Bread Pudding with Rum Sauce, plenty of good wine and then a soak in the hot tub! One great night. Duke thinks the parade is way tooooo long! All ready for the parade, lights, camera, ACTION! Usually at these activities we have some kind of entertainment and tonight was no different. The Sunshine Acres Childrens Choir from Mesa came and performed their Christmas program. Sunshine Acres is a children’s home for children that no longer live with their family for various reason and range in age from 5-16. The choir was mostly made up of 11-14 year old girls who from watching them you would have thought these girls are just like any 11-14 old you know but the stories behind those eyes???? I had a hard time listening to the program because all I could think about was these children, how they all looked so normal and happy, knowing they have suffered pain I know nothing about. This organization does not ask for donations although that is what keeps them going. I don’t think I will be able to get the vision of these kids out of my mind during this holiday season. I know I will be thinking of these kids for a very long time. Check out the link to their website and see what a blessing this place is for these children. 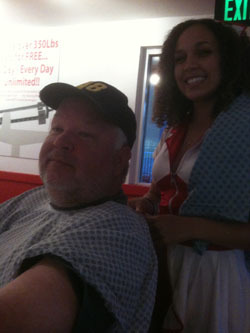 Paul had a little indigestion and we needed to make a trip to the Heart Attack Grill about 5:30 pm. No need for alarm, a double bypass and two Day-Quils and he his feeling much better, Thank you for your concerns! 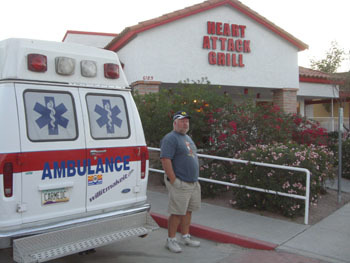 While there I had a Single Bypass without the extras, Thank goodness – yep it was good!!! The bedside manner gets 5***** from all the male patients! Paul really enjoyed his experience and thought the patient care was excellent except he still can’t figure out how to get the admitting wristband off – several more showers and he will be fine! Not to worry - he is feeling better all ready and he has only had 1 DayQuil! I have to say I have never had such a positive experience visiting the Doctor before but this was really fun! 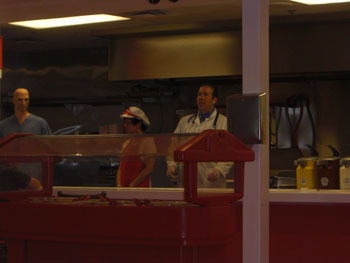 This place may not have the best burgers but you will come back and you will bring friends – guaranteed. Everyone here plays the part and they have all the props right down to your medical chart! Forget the sugar-free they only have Coke and it is in the bottle with real sugar. 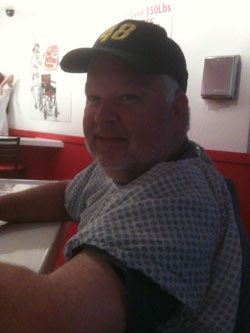 Goodbye Heart Attack Grill - See you real soon! Posted in Arizona | Comments Off on Nurse Kiki???? What is it? Paul tried it! Our friends love it. Monday afternoon they were having their Grand Opening and giving away hot dogs & beer along with entertainment to come see the new Pickle-ball and Bocce Ball Courts so of course I went! FREE anything in this community gets a big crowd and this was no exception – you could barely get near the place. I went and I love the game. It is a variation of Tennis, Ping Pong & Badminton. You play with a large wooden paddle (they have composite graphite ones for the competitors) and a wiffle ball on a court the size of a badminton court with rules that keep you from cramming the ball down the opponets throat! According to the website it was created as a family game and good for seniors! I don’t know about that because I was sweating from just 20 minutes of play – this is going to be my new aerobic exercise.